Chris Cornell’s Bond theme (You Know My Name from Casino Royale) is quite the best of the three Daniel Craig-era theme songs so far and brought him to an audience who never heard Soundgarden or the skyscraping vocals of Cornell’s youth (seriously, Slaves & Bulldozers. Go listen to it. There’s nothing like it. It’s a tour de force. Cornell does everything with his voice that a rock singer can, from Kurt Cobain shrieking to Bruce Dickinson wailing). But perhaps even You Know My Name won’t be Chris Cornell the solo artist’s legacy track. A little over two years ago, a film came out called Seeking a Friend for the End of the World, starring Steve Carell and Keira Knightley – a spectacularly miscast pair, given Knightley’s lack of comedic talent and the 23-year age gap between the two, which is just creepy (recalling the days when Hollywood thought nothing of casting Grace Kelly opposite Bing Crosby in High Society). Its plot was based on a little-known song from Cornell’s forgotten solo debut, Euphoria Morning, called Preaching the End of the World. It is, by Cornell standards, a subdued piece. The first time I heard it (courtesy of Mel) I didn’t even recognise him singing until he started doing that Chris Cornell thing in the choruses; it might actually have been nicer if he’d sung the whole song in the soft, sad quasi-falsetto voice in which he begins the verses. Sadsackery suits him. Soundgarden songs were notable for eschewing simplicity. They tended to be structurally knotty, with odd time signatures and counterintuitive feels. Preaching the End of the World takes Cornell’s love of stretching out musically within the context of a tight, through-composed pop song and applies it to harmony rather than rhythm. It’s a treat for fans of a good chord change. I rather like the Bmin7b5 in the verse under the line ‘Feeling the same way as me’ and the diminished seventh chord formed by raising the bass note of a standard D7 shape a semi-tone under the words ‘feeling just the same’ near the end of the bridge. The C6 in the chorus under ‘You can’t hide’ is pretty sweet too. When did Cornell learn all these Beatles-play-Gershwin chord changes? It’s impressive. But the really impressive thing is the amount of pathos Cornell wrings out of his goofy sci-fi premise. The lyric has to establish character and premise, and make us care. It succeeds on all three fronts, in four and half minutes, rendering the film it inspired unnecessary. This entry was posted in Music and tagged Badmotorfinger, Bing Crosby, Bmin7b5, Bond themes, Bruce Dickinson, Casino Royale, Chris Cornell, Chris Cornell solo, Daniel Craig, Euphoria Morning, George Gershwin, Grace Kelly, High Society, James Bond, jazz harmony, Keira Knightley, Kurt Cobain, Preaching the End of the World, sci-fi, Seeking a Friend for the End of the World, Slaves & Bulldozers, Soundgarden, Steve Carell, The Beatles, You Know My Name on January 21, 2015 by rossjpalmer. Soundgarden were one of the original Seattle ‘grunge’ groups, a term the bands involved would quickly come to hate and resent, but which in 1988 Mudhoney’s Mark Arm had used to describe his own band’s music: a dirty, scuzzy blend of mainstream seventies metal, late-sixties garage, and early-eighties punk. Mudhoney leaned towards the punk end of things; in fact, their biggest debt was to Iggy Pop’s proto-punk outfit the Stooges. Early Nirvana was pretty much equal parts punk and metal – plenty of Sabbath, but plenty of Flipper too. 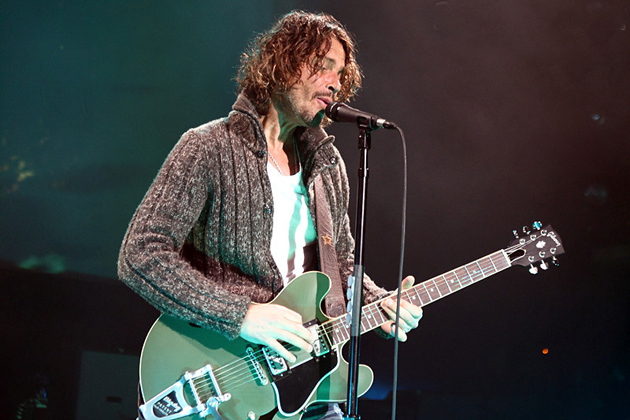 Soundgarden shared some of those influences, but in Chris Cornell had a singer with a classic hard-rock voice, which made it easier for mainstream-label A&R guys to work out where the band was coming from. So it was no surprise when Soundgarden became the first band out of Seattle to put out a major-label record since Heart in the seventies (Mother Love Bone, whose members later regrouped as Pearl Jam, were the first Seattle band to get signed by major, but singer Andy Wood OD’d before the band had released their first LP). Badmotorfinger, released in 1991 on A&M, was actually Soundgarden’s third record, but they’d outgrown Sub Pop’s ability to distribute their records nationally. This problem had plagued the more successful underground bands for years (since Hüsker Dü’s Zen Arcade at least) and was a key reason why they began signing to majors – if fans can’t find your records in shops and the label can’t press enough to keep up with demand, what’s the point in staying with that label? Badmotorfinger got somewhat left behind by the Nirvana juggernaut, but in any event it was a little too arty and dissonant for the mainstream. Chris Cornell might have had an accessible, incredibly versatile rock voice (his vocal on Slaves & Bulldozers is a tour de force: one minute he’s out-shrieking Cobain, the next he’s Ronnie James Dio, then he’s Bruce Dickinson), but Kim Thayil wrenched every conceivable noise out of his guitar except conventional ones, like a less schoolmasterly Robert Fripp. Most rock guitarists given the awesomely sludgy bass riff that Ben Shepherd plays in the intro (placed hard to the left by mix engineer Ron Saint Germain) would have chosen simply to double it while throwing their hair around. Not Thayil, God bless him. His was a cerebral take on metal. There is a guitar track that doubles the bass riff, but the listener’s ear is instead drawn to the squonky squealing noises up top. Pure Thayil. With their frequent use of odd meters, Soundgarden were playing math-rock for a far wider audience than it ever had in the Midwest in the 1980s. They never made a big deal of it though, they simply threw in an extra beat in this measure and took one away in that measure as if it were the most natural thing in the world. On Fell on Black Days and Spoonman they’d even make math-rock into pop music. For this and much else they haven’t really received due credit. Still not enough people talk about how great their rhythm section was. Yet Matt Cameron was a monster drummer (inventive, powerful and groovy, never stiff and always musical) while Ben Shepherd’s bass playing was intense and furious – you can hear how hard he’s hitting his strings on those occasions where he’s not quite tight with Cameron’s snare drum. Soundgarden’s next album, Superunknown, did get them the big mainstream hit that A&M wanted from them. 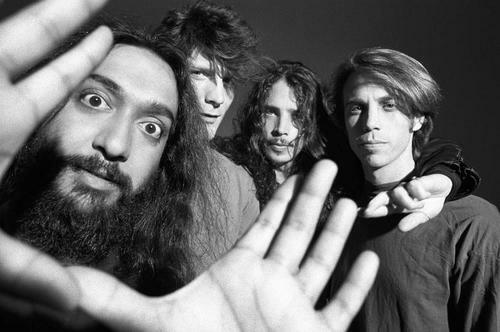 The shift towards a slightly more commercial songwriting style felt like an evolution rather than a cynical change of direction – like Cobain, Cornell had always been a Beatles fan – and like its predecessor it’s an essential nineties rock record, but Badmotorfinger is the Soundgarden record where they sound most like themselves, the record that only they could have made. They’re back touring and making records again, and that’s great. They’re unlikely to do anything cheesy or regrettable, but it’s also unlikely they’ll do anything to top the music they made in the first half of the nineties. I’d love to see it happen though. This entry was posted in Music and tagged A&M, Badmotorfinger, Ben Shepherd, Chris Cornell, grunge, Kim Thayil, Matt Cameron, Ron Saint Germain, Slaves & Bulldozers, sound recording, Soundgarden, Superunknown on May 28, 2013 by rossjpalmer.